Happy 20th Anniversary, The Late Show! 20 years ago today, “Generation X”ers (and a few older “Generation Y”ers) were about to embark on a new form of Australian comedy. Channel 7 sketch comedy show Fast Forward was the talk of the town, into their 4th season, but was nearing the end of its life cycle. Where will Australia turn to for laugh-a-minute and toilet humour? Bring in Santo Cilauro, Tom Gleisner, Jane Kennedy, Tony Martin, Mick Molloy, Rob Sitch and Jason Stephens. With sketch comedy experience in their blood already (from their earlier sketch show The D-Generation) and after a failed Channel 9 pilot The Late Late Show, the Australian Broadcasting Corporation parts with 8 cents a day and cleans out the 10pm Saturday night time slot to create The Late Show. Here’s the first sketch that was shown 20 years ago at 10pm, Saturday night – 18/7/1992. Tony Martin as Prince Charles. Unfortunately the joke is outdated (with the unfortunate loss of Princess Diana in 1997), but that is what makes it Champagne Comedy – vintage – 1992. “Why isn’t there a reunion special or something?” Santo The Magnificent hears you think… while we would all love that, time has changed the working patterns of the cast, as they’re all doing their special thing. 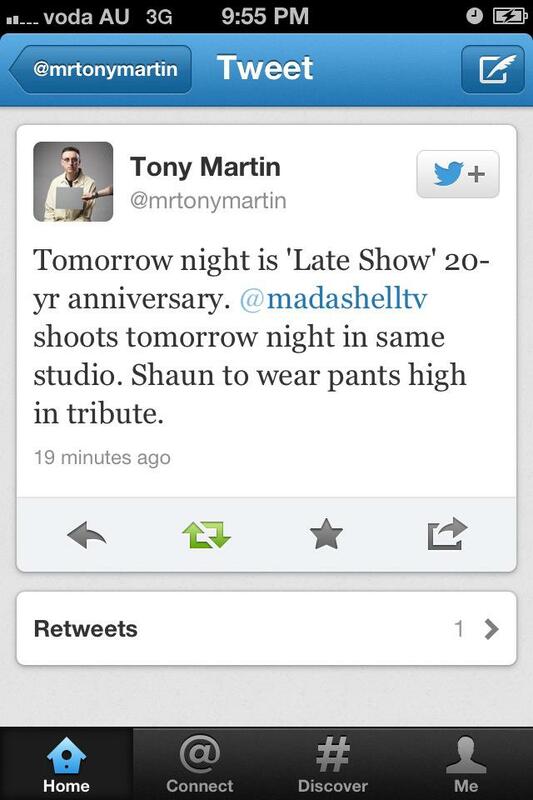 However,Tony Martin acknowledged the anniversary on Twitter the night before. Due to copyright and legal reasons, we cannot show you full episodes. But if you look hard enough on the interwebs, you may find something floating around. Or hit up youtube. First appearance of Mick Molloy and Jason Stephens’s segment – Muckraking. * Re-watch your Champagne Edition DVDs, search YouTube, or dust off your VHS tapes. This Saturday 21 July 2012, we’re going to be watching the first episode at 10pm AEST and tweeting about it as it ‘goes to air live’. Feel free to join in when that begins. The first Graham and The Colonel segment from episode one. What stories can you remember when The Late Show was on? Were you 12 and sitting in the loungeroom in your PJs while your parents slept? Were you having dinner parties and talking about standing on the summit of Mt Everest? Were you even born? Shoot about a paragraph of your memories to info@champagnecomedy.com or post below. Thank you for keeping the bubbles sparkling in the champagne. Brisbane……. 1992 – I was in Grade 9 at high school. Discovered the opening few episodes by accident. Think my knowledge of them fed off of their song “Five in a row”. From then on, every Saturday night, I’d watch the show live AND record it on the VHS. By the time I got to school on Monday morning, I’d easily watched it 3 times, memorising it almost verbatim. Soon the Late Show became my week(end)ly ritual. You couldn’t refer friends to a Youtube clip on a mobile phone so they could Foxtel IQ it. Nope. You had to tell them to watch it (or hope they knew how to program a VHS player). As soon as Graham and the Colonel started, I knew they were on the “go home” phase, bringing it all together. I think I even willingly watched just enough minutes of lead-in show “Birds of a Feather” to have actually found it to be funny at that age. Ahhhhh, you crazy housewives and your tramp of a female friend (neighbour ? ), will you ever learn…. bruvva ? Final 2 years of high school – missed The Late Show terribly but enjoyed Martin/Molloy. I’d gt home from school and ready myself for the 4-6pm listening fest most days. I’m positive I still have their final 4 hour show on audio cassettes somewhere. Must seek them out and digitise it to enjoy it again. If I could do-over my 20s again, I’d so have loved to have been in that circle in Melbourne in the 1990s. Instead, I think they kinda dictated the ways I try to be funny myself. Guys we quote sooo many of your lines in our every day lives You have sewn together the fabric of our lives How does it feel to be responsible for that LOL ur the best We loved every moment and will continue quoting and laughing Thank you!!! Yes I was a little older than 12, in my pjs watching The Late Show IN my parents’ bedroom and my parents were waiting for me to get out so they could go to sleep…yep I was taught a lot about being a champagne comic in those few short years. In 1992 I was in my final year of high school, and never missed an episode. The Late Show and Triple M’s Danger: Low Brow are the only things that make me nostalgic for that year. I was 9, and I used to watch the show though my slightly ajar bedroom door, where I could see the TV in the loungeroom. My parents wouldn’t realise until I couldn’t control a laugh, and alas, I would have to retreat. Thank god for the video and subsequent DVD releases!